Work in pairs. You are lost on a deserted island. You have one-day's water and food supply at hand but nothing else. Find out 5 vocabulary words in the puzzle, and meanwhile, you might stumble about some things dropped down from the crashing airplane, which maybe are useful for your survival on the island. Find out all the 5 words and as many survival items as possible. Afterwards, convince your partner that your items are more important to survival. 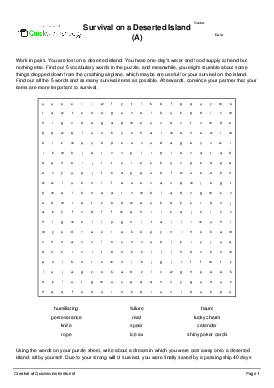 Using the words on your puzzle sheet, write about a dream in which you were cast away onto a deserted island, all by yourself. Due to your strong will of survival, you were finally saved by a passing ship 40 days later.